Markets are going through an extremely turbulent patch right now as stocks, bonds, currencies, and commodities all face increasing volatility. Bank of America Merrill Lynch explains how these conditions are ripe for a “flash crash,” and outlines what final steps must occur for the market to be plunged into widespread chaos. There’s no denying it’s a turbulent time in markets. Stocks suffered through an epically bad October, and came under renewed stress this past week. Debt markets faced serious pressure as the bonds for market stalwart General Electric tumbled to record lows. And oil is fresh off a 12-day skid — its longest of all time. Turbulence has also rocked currency markets. The British pound-US dollar pairing has been particularly unstable in recent days as rate-hike guidance from the Federal Reserve and speculation around a Brexit collapse have whipsawed rates. This rising cross-asset volatility is one of a handful of elements creating a highly vulnerable situation in markets — one that could result in a so-called flash crash, according to strategists at Bank of America Merrill Lynch. BAML is also worried about what it describes as “vicious deleveraging,” which is when a company attempts to reduce its debt burden by quickly selling assets. 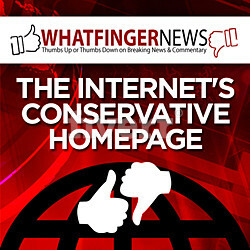 This is a particularly pressing issue in China right now. And the US faces its own reckoning of sorts as the Fed hikes rates, which raises lending costs and makes refinancing more difficult. 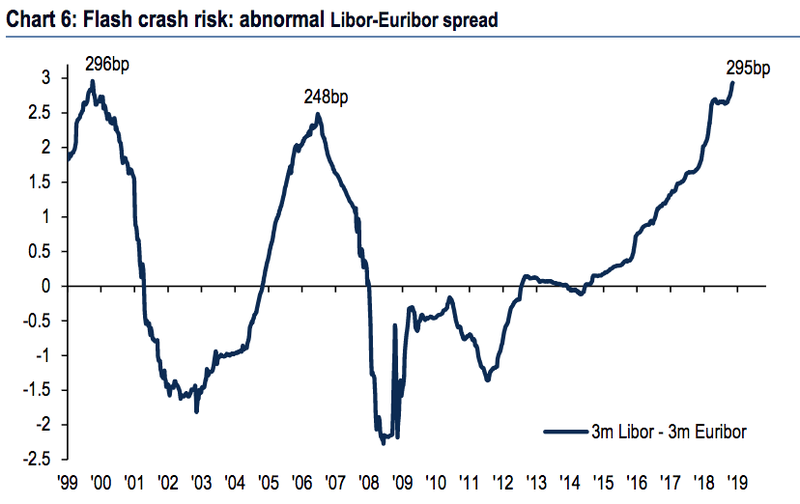 There’s also what BAML refers to as “dislocation risk,” which can be highlighted by “abnormal spreads.” The example the firm provides is the spread between Libor and Euribor — both of which represent the rates at which European banks lend to one another. As the chart below shows, the relationship between them is the widest it’s been since 1999 — or the period preceding the dotcom bubble. But with markets supposedly at the precipice of disaster, BAML says there are a couple other things that have to happen in order for them to truly melt down. The first revolves around the US dollar, which has surged since April as the Fed has reiterated its rate-hike schedule, and as tensions surrounding President Donald Trump’s trade war have ratcheted higher. BAML says a “violent” move in the dollar could catalyze a flash crash. Considering the strengthening greenback has been seemingly pricing in further monetary tightening, a surprising dovish signal from the Fed could send it diving, thereby increasing volatility. Another possible agent of cross-market chaos could be shocking macroeconomic data, says BAML. If this scenario were to play out, it could force abrupt downgrades in both gross domestic product (GDP) and earnings growth. GDP is the bellwether reading for a nation’s economy, and any sort of downward rerating could scare investors into a more defensive stance, leading to sharp selling in riskier assets like stocks. Meanwhile, profit expansion has been the foremost driver of gains throughout the almost 10-year bull market, and any chink in its armor could also send equities careening lower. Of course, there’s no guarantee that these factors will combine to cause the next major market crash. They’re simply hot-button catalysts that investors would be wise to monitor. Because whether a meltdown transpires or not, the overall investment landscape looks dangerously unstable — and ripe for surprises.